Putting my Shark and Dyson in the trash! I will never pick the dirt out of the dustbin of a vacuum cleaner with my fingers ever again! No more bagless vacuums for me! This is a sweet little machine, quiet, efficient, retractable cord, easy to maneuver, has all the attachments, Made in Germany. Powerful and yet quiet. And real bags - no more banging dustbins in the trash - leaving a ring of dirt on the floor, poking or picking gobs of hair and dirt. Oh, can you tell how much I’ve hated my years of Dyson and Shark vacuums? Buh-bye! Thanks Overstock for a great deal on the Miele from Germany! 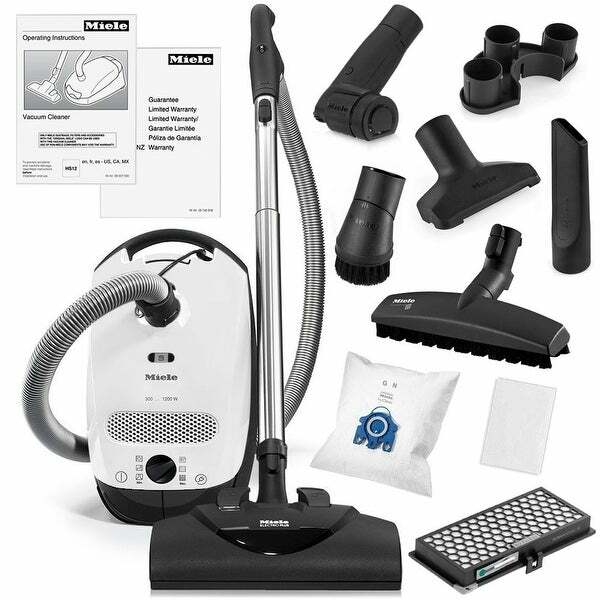 The Miele C1 Cat and Dog Vacuum Cleaner is Extremely Lightweight, Made to Last the User an Average of 20 Years, Sports Miele's Extra Large G/N Bag, an STB 20 Handheld Mini Turbo Brush, a SBB-3 Parquet Floor Brush and More! The Miele Cat and Dog is a true dream come true. The Miele Cat and Dog C1 uses Miele's 1,200 Watt Motor found on all other Miele Vacuum Cleaner Canisters providing the user with plenty of power. Electronic suction dial is located at the back of the machine, Settings include drapes, furniture, throw-rugs, quiet setting, Large area rugs and wall to wall carpet/bare floors. Controls range from 200 Watts to 1200 Watts. The Miele Cat and Dog comes packed with a Crush-Proof Ergonomic Hose that has a Vario-Clip located at both the base of the hose handle and the machine connection piece which stores your included Crevice Tool, Upholstery Tool and Dusting Brush on the machine. The Miele Cat and Dog also comes with stainless-steel telescopic wands that easily connect to the floor brush and hose with a simple click. This electrically driven carpet tool with an extra wide brush roll lets you adjust height based on the pile of the carpet and is perfect for deep cleaning medium to high pile carpet. This amazing powerhead is extremely powerful and almost pulls itself making cleaning easy and fun. The Miele SBB-3 Parquet Floor Brush is the perfect tool for any bare floors surface, such as wood and tile. The Parquet Floor Brush has two soft rollers that allow for easy gliding action and sports genuine horsehair bristles that gently sweep the surface while brushing dust particle out of cracks. The Included Miele STB-20 Handheld Mini Turbo Brush has a flexible swivel joint, perfect for vacuuming cramp spaces like cars seats and floors to stairs. The high-speed rotating brushroll will remove even the most stubborn hair from furniture and carpeting. Plus, it's ergonomic for both left and right handed people! The Active Air Clean filter combines the Super Air Clean filter with an active charcoal cassette which absorbs odors from the dust bag --especially useful if you have pets. The large amount of active charcoal truly helps remove unpleasant smells. We have had many Miele vaccums and they never dissapointed us. This little machine is compact but powerfull, loaded with all accessories. We find it in Overstock at an ubeatable price. Delivered on time without a single problem. Bravi Miele & Overstock. This vacuum is so quiet and light. It does great keeping up with my three dogs, all of whom shed a ton. This is very easy to assemble and can quickly be used out of the box. I love the self retracting cord. I read reviews online and looked around at other canister vacuums. This is rated the BEST for pets, and I have 4 dogs and 3 cats, so I need something that is reliable and good at getting up pet hair. I know the Miele brand is top of the line, and the price couldn't be beat, especially with w $50 coupon! I can't air to get this vacuum and retire my old Kenmore.